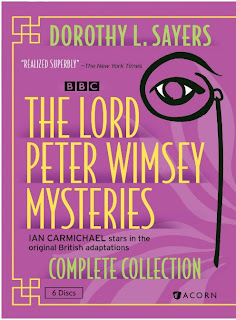 You would think that being a titled aristocrat would come with enough responsibilities to keep one busy, but Lord Peter Wimsey finds plenty of time to devote to crime-solving in the delightful Lord Peter Wimsey Mysteries. The series, based on the stories by Dorothy L. Sayers, contains 5 episodes which were originally broadcast in the 1970s. Ian Carmichael stars as the dashing, intelligent Lord Peter. Although the episodes don't take place in chronological order, we do get some information about Wimsey from each of them. The events in the series take place from WWI through to the 1930s. We are shown how Wimsey and his butler/assistant, Bunter, came to have such a strong bond. After serving together in the trenches in WWI, Wimsey was rescued by Bunter following a bunker bombing. 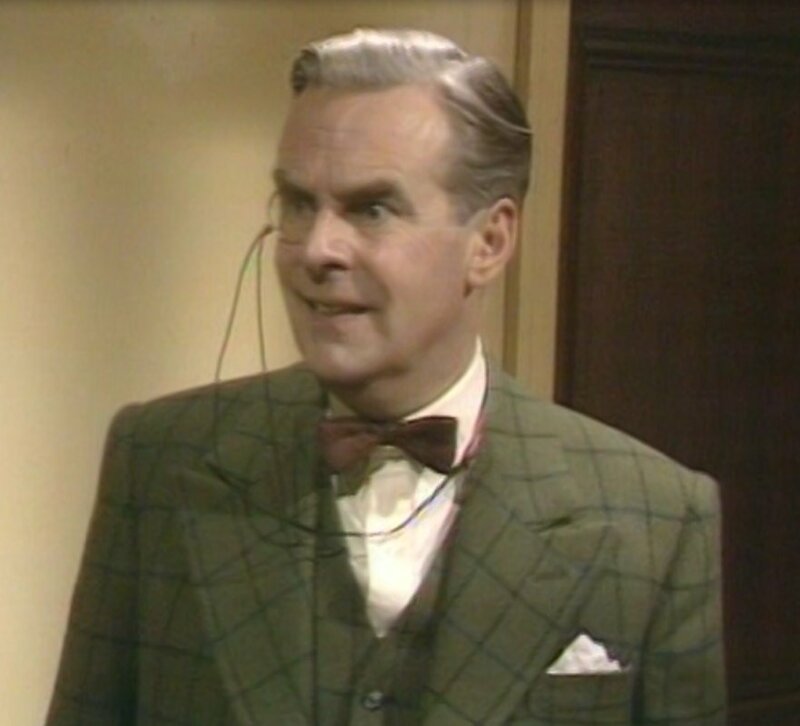 That isn't the only time Bunter comes to Wimsey's aid, as he pulls him from a bog, disguises himself to go undercover in investigations, and basically takes care of things while Wimsey goes off in search of clues. On several occasions, it's left to Bunter to look around and, wondering where Wimsey's disappeared to, goes in search of his boss only to find him in a tricky situation. Wimsey is never deterred, though, and generally goes dashing off in search of clues with little regard to placing himself in jeopardy. I guess we would all do the same if we had a Bunter to come to our rescue! 1. Clouds of Witness -- The fiance of Wimsey's sister is found shot to death, and his brother, the Duke of Denver, is charged with the murder. 2. The Unpleasantness at the Bellona Club -- An old man is found dead at Wimsey's club, but due to a provision of his will, it becomes imperative that Wimsey discover exactly what time he died. 3. Murder Must Advertise -- Wimsey goes undercover as a copywriter at an advertising agency to discover if a workplace accident was really murder (this episode features a very young Christopher Timothy). 4. Five Red Herrings -- With six suspects in the frame, Wimsey must narrow them down and find the real killer. 5. The Nine Tailors -- Some emeralds go missing after a wedding at a stately home, and Wimsey must solve the mystery several decades later. problem of my not paying close enough attention, rather than any fault of the production! 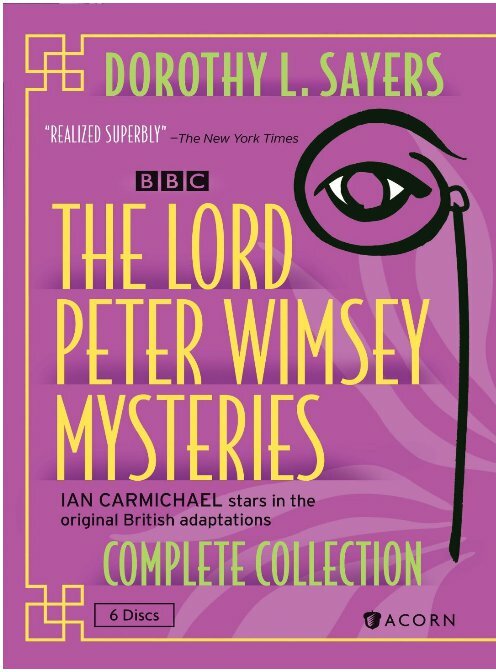 I really enjoyed the character of Lord Peter Wimsey. With no apparent money problems, he's free to indulge his passions: music, cars, attending society functions, and of course, solving murders. Unexpected talents also are highlighted from time to time as we learn that he is an accomplished bell-ringer (takes some skill) and is an admired author of at least one book, "Notes on the Collection of Incunabula." Most of the disks also include portions of an interview with the actor who portrayed Wimsey, Ian Carmichael. It was fascinating to see how long he had to agitate for the series to be made before he was finally successful. He states that by the time it was agreed to make the series, he already felt too old to play Wimsey, but he took on the role anyway. He does a marvelous job as the cheerful, intelligent and utterly suave sleuth!